Alexander Mitchell Palmer, who was born in Moosehead, Pennsylvania, USA, on May 4, 1872 is a lawyer and Attorney General of the United States from 1919 until 1921. He is a graduate of Swarthmore College, Pennsylvania in 1893. Later he studied for two years science of law and became a prominent attorney in Pennsylvania. 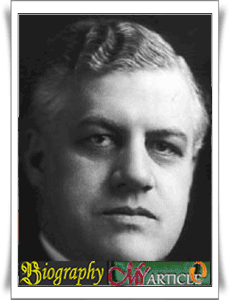 In 1908, he was elected as a representative of America for the Democratic Party and re-elected in 1910 and 1912. He was a moralist and renewal carrier that has the ability to argue that qualified. His efforts in the fight for women's suffrage and abolition of child labor has a major influence in the improvement of his reputation. Until in 1919 he was asked to become an attorney general by President Woodrow Wilson. Previously, he never refused the offer as a board member, because he does not want to be active in politics. Mitchell Palmer never claimed that Communist agents of Russia plans to overthrow the government of the United States. At the time of the second anniversary of the Russian Revolution on November 7, 1919, Palmer and his assistant Edgar Hoover arrested more than 10,000 people who were suspected of being communists and anarchists. Palmer and Hoover did not find evidence that the communists are planning to move to the American Revolution. Around 247 people, including a woman named Emma Goldman was deported back to Russia and most of the others were released. In January 1920, Palmer and Hoover re-arrested about 6,000 people suspected communists in several cities. Action that they both do eventually known as the Palmer Raids. Most of those arrested were members of the Industrial Workers of the World (IWW). After the revolution ever claimed by Palmer can not be proved, he began to change and many people criticize him as a person who does not respect the freedom in society. In 1920 he had tried to run for president of the Democratic party, but his efforts failed. He is no longer an important part of the Democratic party. Alexander Mitchell Palmer died on May 11, 1936 in the city of Washington.